The suitable design of international monetary and financial arrangements for the global economy is a long-standing issue. A key shortcoming of the existing system is that it tends to heighten the risk of financial imbalances, leading to booms and busts in credit and asset prices with serious macroeconomic consequences. These imbalances often occur simultaneously across countries, deriving strength from international spillovers of various types. The global use of the dollar and the euro allows monetary conditions to affect borrowers well beyond the respective issuing economies. Many countries also import monetary conditions when setting policy rates to limit interest rate differentials and exchange rate movements against the major currencies. The global integration of financial markets tends to reinforce these dynamics, by allowing common factors to drive capital flows and a common price of risk to move bond and equity prices. Policies to keep one's own house in order by managing financial cycles would help to reduce such spillovers. In addition, central banks need to better internalise spillovers, not least to avoid the effects of their actions spilling back into their own economies. Moving beyond enlightened self-interest would require international cooperation on rules constraining domestic policies. The suitable design of international monetary and financial arrangements for the global economy is a long-standing issue in economics. Putting in place mechanisms that facilitate the achievement of sustained, non-inflationary and balanced growth has proved elusive. In the wake of the Great Financial Crisis, the issue has again gained prominence on the international policy agenda. Just as in the past, however, there is little agreement on what the key shortcomings of the current international monetary and financial system (IMFS) are, let alone on what to do about them. A common diagnosis has been that the system is unable to prevent the build-up of unsustainable current account imbalances and that this, in turn, has induced a contractionary bias: surplus countries have no incentive to adjust, while deficit countries are forced to do so. Indeed, current account imbalances have been a focus of G20 cooperative efforts. The chapter is structured as follows. After outlining the key features of the IMFS, the first section explains and documents how the interaction of domestic monetary and financial regimes increases financial imbalances. It highlights several factors: (i) the role of monetary areas that for the key international currencies (notably the US dollar) extend well beyond national borders; (ii) the limited insulation properties of exchange rates, which induce policy responses designed to avoid large interest rate differentials vis-à-vis the main international currencies; and (iii) the powerful waves generated by freely mobile financial capital and global liquidity, which wash across currencies and borders, carrying financial conditions across the globe. The second section considers possible solutions. It highlights the need to adjust domestic policy frameworks and to strengthen international cooperation, going beyond the own-house-in-order doctrine. The IMFS comprises the arrangements governing transactions in goods, services and financial instruments among countries. Today, it consists of a set of domestically oriented policies in a world of largely free capital flows. Domestic monetary regimes focus mainly on price stability, while currencies are allowed to float to varying degrees: free floating among the principal international currencies coexists with greater or lesser management of other currencies. Financial regimes generally allow funds to move freely across currencies and borders, although some countries still impose restrictions. The main restraint on financial transactions takes the form of prudential regulation and supervision, in part based on internationally agreed standards. Current arrangements differ markedly from the previous system, Bretton Woods (1946-73). At the time, the US dollar's convertibility into gold served as an external monetary anchor, and currencies were tied together through fixed but adjustable exchange rates (Table V.1). Domestic monetary regimes in general gave less priority to price stability and more to external balance and demand growth. While the anchor ultimately did not prove that strong, the arrangements contrast with present ones, in which the aggregation of monetary policies pursued under domestic mandates acts as the only overall constraint. During the Bretton Woods era, the leading international currency was the dollar, which now shares this role to some extent with others, mainly the euro. And international capital mobility was quite limited, reflecting a myriad of restrictions on "repressed" domestic financial systems. The performance of the two systems has differed markedly as well. Bretton Woods did not see major episodes of financial instability, but eventually proved unable to ensure lasting global monetary stability. It broke down once the United States formally abandoned gold convertibility and exchange rates were allowed to float. Current arrangements have succeeded in promoting price stability more than financial stability. Arguably, this is no coincidence. The 84th Annual Report, as further elaborated in other chapters of this Annual Report, explored why domestic monetary and financial regimes have so far been unable to ensure lasting financial stability. But their interaction through the IMFS has also played a role, by compounding rather than limiting the weaknesses of domestic regimes. Consider, in turn, the interaction of monetary and financial arrangements. The interaction of monetary regimes spreads easy monetary conditions from core economies to the rest of the world. The international use of reserve currencies does so directly, and the strategic conduct of monetary policy does so indirectly. Take each in turn. The reliance on a single global currency has diminished slowly since Bretton Woods, but the US dollar continues to play a dominant role in international trade and finance, alongside the euro. As a means of exchange, the dollar is on one side of no less than 87% of foreign exchange market transactions (Table V.2), with an even higher share of forward and swap transactions. Its dominance in foreign exchange markets makes the dollar the sole intervention currency outside Europe and Japan, which supports its high share in foreign exchange reserves. More than half of world trade is invoiced and settled in dollars, pointing to the greenback's pre-eminent role as a unit of account. Remarkably, the advent of the euro and the dollar's trend depreciation since the 1970s have not materially challenged the dollar's role as a store of value (Graph V.1, left-hand panel). At 63%, it maintains almost three times the share of the euro in foreign exchange reserves. Its share in both official reserves and private portfolios is sustained by the scale of what can be termed the "dollar zone" of economies whose currencies move more closely with the dollar than with the euro (Box V.A). At half or more of world GDP, the dollar zone is far larger than the US economy, which is less than a quarter. Monetary policy settings for key international currencies influence financial conditions outside these currencies' home jurisdictions directly through their impact on interest rates and the valuation of assets or liabilities denominated in these currencies but held or owed by non-residents. In particular, dollar and euro credit to non-bank borrowers outside the United States and euro area stood at $9.5 trillion and €2.3 trillion ($2.7 trillion), respectively, at end-2014. The dollar debt represents a seventh of global GDP outside the United States (Box V.B). 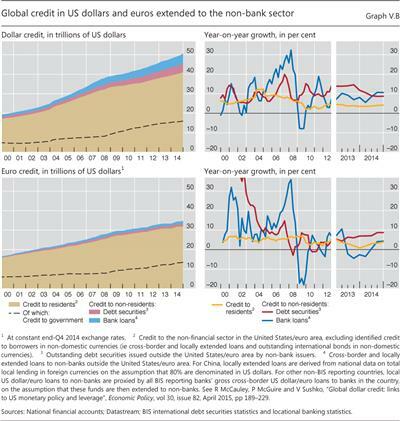 The large stocks of dollar- and euro-denominated credit extended to borrowers outside the United States and the euro area, respectively, mean that Federal Reserve and ECB policies are transmitted directly to other economies. The impact depends on the characteristics of the instrument in question, notably its maturity and the flexibility of the corresponding interest rate. For instance, in the case of bank loans priced off of dollar Libor or Euribor, changes in short-term policy rates pass through within weeks. Over half of dollar and euro credit to borrowers outside the United States and euro area remains in the form of bank loans. The pass-through is slower for bonds, given their generally fixed rates and longer maturity, but then quantities can respond too. In particular, some stocks of dollar bonds have changed quite markedly in response to unconventional monetary policy (Chapter IV). Low yields reflecting the Federal Reserve's large-scale purchases of Treasury and agency bonds, among other factors, led US and global investors to seek yield in lower-quality bonds. The impact was especially pronounced for non-US borrowers, who between 2009 and 2014 ramped up their dollar bond issuance by $1.8 trillion (Graph V.2, left-hand panel). 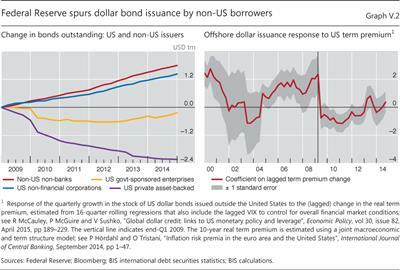 Investor demand for such bonds proved highly responsive to the compression of the term premium, as measured by the spread between Treasury bond yields and expected bill yields: the lower the premium, the faster the growth of dollar bonds issued by non-US borrowers (hence the negative relationship after the first quarter of 2009 seen in the right-hand panel of Graph V.2). By the same token, the recent ECB large-scale bond purchases and compression of term premia on euro-denominated bonds raise the question of whether borrowers outside the euro area will take advantage of the funding opportunity. In fact, by the end of 2014 the stock of euro bonds issued by such borrowers was already growing as fast as its dollar counterpart. Post-crisis, offshore dollar credit has grown fastest in those jurisdictions where it has been cheapest relative to local funding, especially emerging market economies (EMEs).2 Authorities around the world use capital controls or macroprudential policy to raise the cost of dollar borrowing at home, but their policy reach does not extend to activities of multinational firms, which can borrow dollars (or euros) offshore to sidestep tight domestic funding conditions. This is one reason for the rapid growth in various quantitative measures of "global liquidity", which denotes the ease of financing in global financial markets (Box V.B). This box uses simple regression methods to place currencies in three zones of influence corresponding to the main international currencies based on the currencies' degree of co-movement. 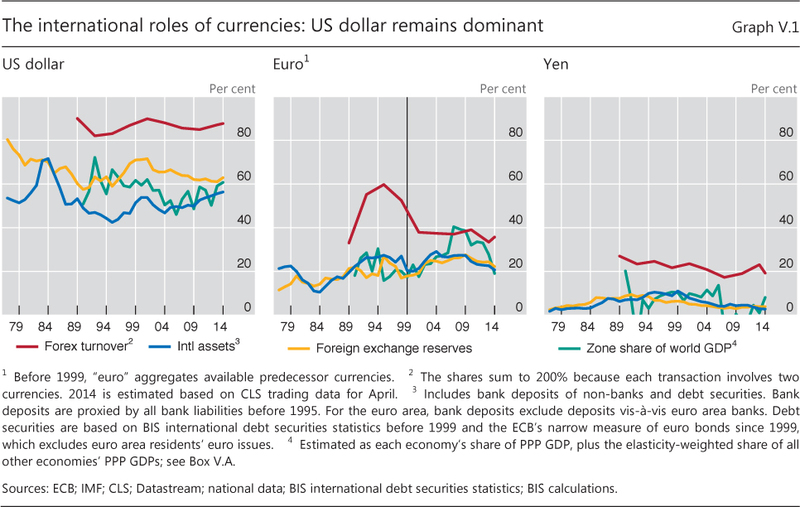 The three reference currencies are the dollar, the euro (before 1999, the Deutsche mark) and the yen, consistent with their status as the three most transacted currencies in the world in the BIS Triennial Central Bank Survey. Thus defined, the dollar zone accounts for nearly 60% of world GDP, far more than the US share in world GDP, which is between 20 and 25%. The dollar share is calculated in two steps. First, each currency is placed in or between zones. Each currency's weekly percentage change against the dollar is regressed on the weekly percentage change of the euro/dollar and yen/dollar rates. The dollar zone weight is calculated as 1 minus the corresponding regression coefficients. For example, the Hong Kong dollar is pegged to the US dollar, so the coefficients are zero and the dollar zone weight is 1. For the intermediate case of sterling, in 2013 the pound's estimated coefficient is 0.60 on the euro/dollar rate and 0.09 on the yen/dollar, making the currency's dollar weight 1 - 0.60 - 0.09, or 0.31. The results in Graph V.A show the dollar to be more global, the euro to be more regional and the yen to lack much external influence. The dollar weights can thus be read in reverse as euro weights, eg with the dark blue area representing over 95% euro weight. Second, the dollar share is calculated across currencies using (PPP) GDP weights. The dollar zone weight for each of the 40 economies (50 before the euro) is multiplied by the respective GDP, and the product is added to the US GDP. This sum is then expressed as a share of the total GDP of the 43 major economies analysed, including those of the United States, the euro area and Japan. Graph V.1 plots these aggregate zone shares of global GDP. There is strong cross-sectional evidence that a currency's co-movement with the dollar shapes the currency composition of its external portfolio, both official and private. For the two dozen economies that disclose the currency composition of official reserves, the dollar zone weight accounts for about two thirds of the variation in the dollar share across countries. And in larger samples, the dollar zone weight is also strongly linked with the dollar share of cross-border bank deposits or loans and international bonds. The underlying motivation is the same for the official and private sectors: matching the portfolio weights to the co-movements of the domestic currency with major currencies serves to minimise the volatility of portfolio returns when measured in domestic currency. 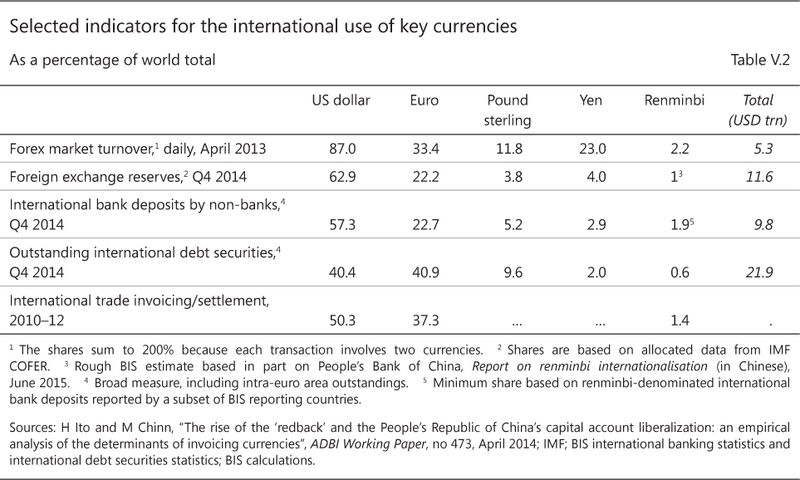 See R McCauley and T Chan, "Currency movements drive reserve composition", BIS Quarterly Review, December 2014, pp 23-36. Monetary regimes also interact indirectly, through central bank responses to each other's policies. 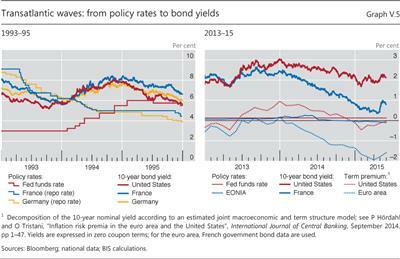 Central banks seem to set their policy rates with an eye on those of the Federal Reserve or ECB. This behaviour is sometimes explicitly noted, as in the cases of the Central Bank of Norway and the Swiss National Bank with reference to ECB policy, but appears to be widespread. One reason is to limit exchange rate movements. Exchange rate flexibility has often been described as insulating the domestic economy from external developments, but this insulation is often overstated. In particular, appreciation can lead lenders to consider firms with debts denominated in foreign currency as better capitalised and therefore more creditworthy, reducing perceived risks associated with lending and increasing the availability of credit.3 Through this and other mechanisms, such as carry trades and momentum trading, currencies can overshoot, shrinking the traded goods sector and leaving the economy vulnerable to a turn in the ease of global financing. Then, depreciation can lead to financial distress among firms with foreign currency debt. During the dollar's downswing from 2002 to 2011 (with an interruption in late 2008), many central banks resisted unwelcome appreciation against the dollar, in setting their own policy rates and by intervening in the currency market. Indeed, many countries - not only EMEs but also advanced economies - appear to have kept interest rates below those that traditional domestic benchmarks would indicate, partly in response to low rates in core currencies. In the 1990s, policy rates were broadly in line with the Taylor rule, a simple interest rate rule prescribing a mechanical reaction to the output gap and the deviation of inflation from target. In the early 2000s, however, actual policy rates drifted persistently below the levels implied by the Taylor rule, suggesting that monetary policy became systematically accommodative (Graph V.3). Many advanced economies apparently hesitated to raise interest rates during the boom, and have maintained them near zero since the crisis. For their part, EME authorities appear to have set policy rates low out of concern over capital flows and appreciation (Graph V.3, right-hand panel). The empirical significance of US interest rates in influencing policy rates elsewhere provides additional evidence for follow-the-leader behaviour (Box V.C). While this simple exercise has important limitations, it points to competitive easing as a way of sustaining external demand. More than 20 central banks have eased monetary policy since December 2014, some explicitly responding to external conditions (Chapter IV). 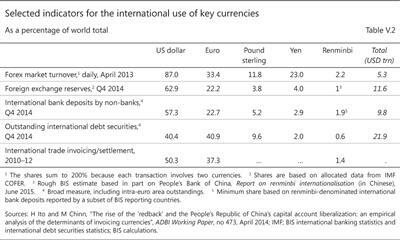 Over the past several years, the BIS has developed indicators to track global liquidity conditions. The term global liquidity is used to mean the ease of financing in global financial markets. Total credit outstanding is one of its main footprints, as it shows the extent to which bond markets and banks have led to the build-up of exposures. In covering US dollar and euro credit, this box focuses on the two largest components of global credit through which the monetary policies of the respective currency areas directly influence financial conditions in the rest of the world. Global credit can be extended through bank loans or bonds, and each has a domestic and an international component. Graph V.B shows dollar- and euro-denominated debt, broken down by the location of the borrower. 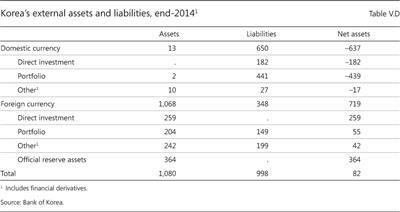 Some 80% of global non-financial dollar debt at end-2014 was incurred by US residents (top left-hand panel). Their liabilities include US public debt, US household debt and US corporate debt. But $9.5 trillion (19%) of dollar credit was extended to non-bank borrowers located outside the United States, and these entities are as exposed to the US monetary policy stance as US residents are. At 13% of non-US GDP, the stock of offshore dollar credit exceeds its euro counterpart worth $2.7 trillion (bottom left-hand panel). Compared with borrowing in US dollars, a larger share of overall borrowing in euros takes place from inside the same currency area (92%). The international credit component tends to be more procyclical and volatile. International bank lending in both dollars and euros outpaced domestic credit in the boom that preceded the Great Financial Crisis, and contracted once the crisis broke out (Graph V.B, right-hand panels). Bond markets partly substituted for impaired bank lending in the immediate aftermath of the crisis, and increased demand for funding went hand in hand with higher yield spreads. Since 2010, the search for yield has enabled a surge in issuance at compressed spreads that has helped to push the share of bonds in international credit to 46%. In this second phase of global liquidity, bond markets and the asset management industry have taken centre stage in shaping global liquidity conditions. 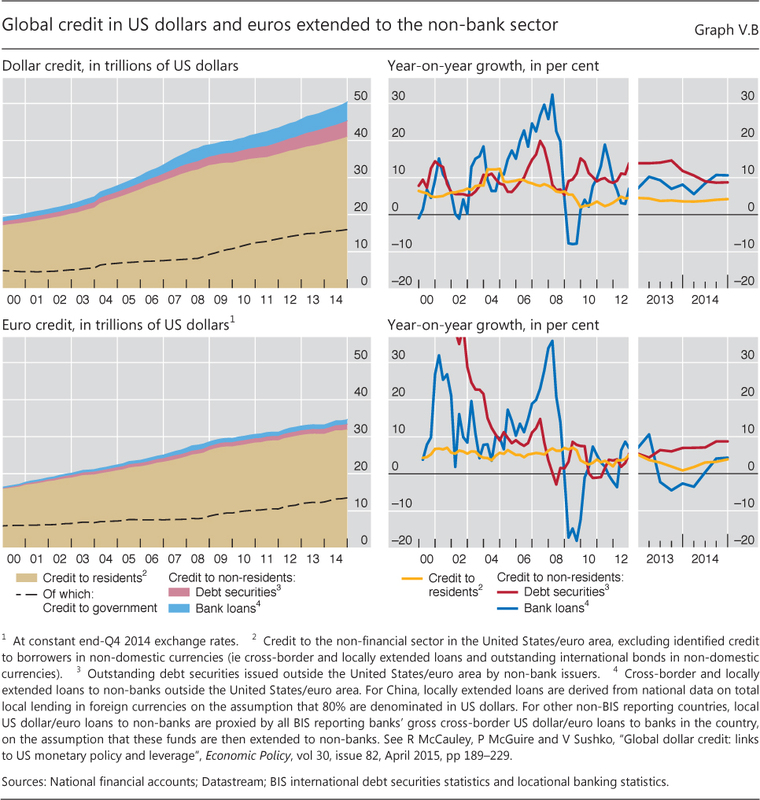 See BIS, "Highlights of global financing flows", BIS Quarterly Review, March 2015, pp 13-29; and www.bis.org/statistics/gli.htm. Resistance to appreciation has also taken the form of currency intervention, which itself feeds back into global monetary ease. Many central banks have intervened directly in the foreign exchange market, typically buying dollars, and then investing the proceeds in bonds issued by the major governments. Unlike major central banks' large-scale domestic bond purchases, reserve managers have not sought to lower yields in the bond markets in which they invest. Nevertheless, the secular reserve accumulation and balance sheet policies of major central banks have combined to push estimated official bond holdings to more than $12 trillion out of the $31 trillion in US, euro area, Japanese and UK government bonds (Graph II.9, left-hand panel). Such holdings account for over half of the outstanding stock of US Treasury securities and more than 40% of the combined stock of Treasury and agency securities (Graph II.9, right-hand panel). As a result, monetary policies of advanced and emerging market economies have reinforced each other. Easy monetary conditions at the centre have led to easy monetary and financial conditions in the rest of the world: there, firms and governments have boosted dollar and euro borrowing and authorities have resisted unwelcome currency appreciation. In turn, their foreign exchange intervention has raised official investment in major bond markets, further compressing bond yields there. With central banks and reserve managers bidding for duration shoulder to shoulder with pension funds and life insurers, bond yields have declined to record lows and the term premium has turned negative (Chapter II). Financial market integration has allowed common global factors to drive capital flows and asset prices. The common factors have partly shifted between the two phases of global liquidity, pre- and post-crisis. 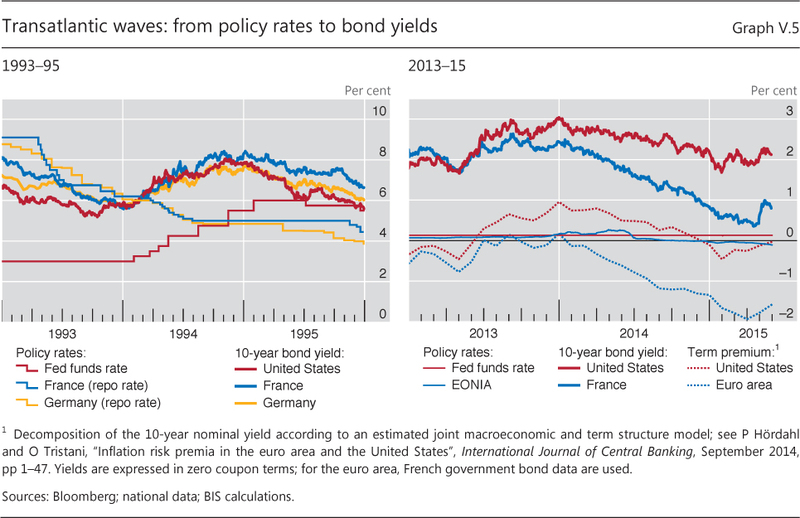 Over recent years, interest rates in EMEs and advanced economies moved closely together with interest rates in large advanced economies, particularly the United States. This close correlation could reflect the response to common macroeconomic developments affecting all countries. 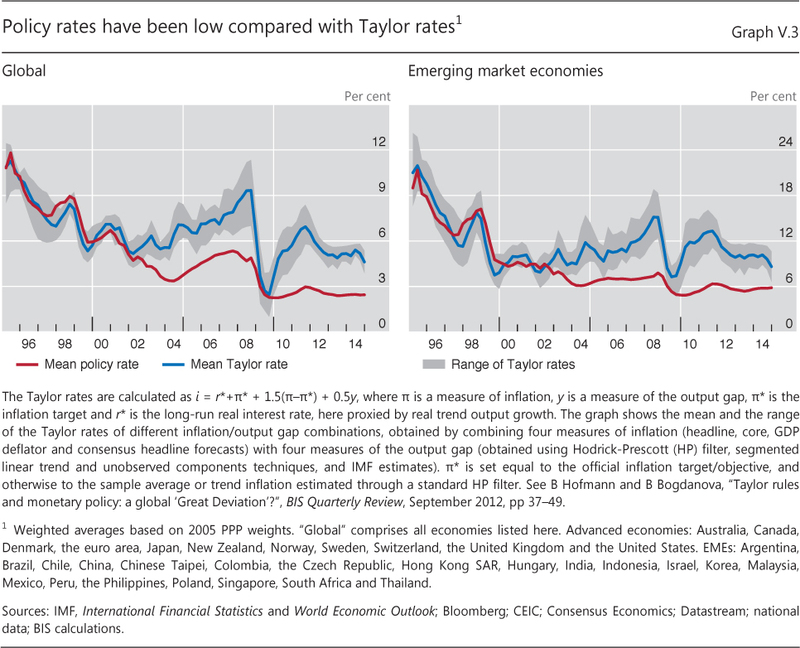 But it could also reflect global interest rate spillovers from large advanced economies. Interest rate spillovers can result from explicit exchange rate policies or attempts to contain exchange rate and capital flow pressures resulting from yield differentials vis-à-vis key currencies, and from global investor arbitrage tying capital market rates together. To shed light on this question, a panel of 30 emerging market and advanced economies over the period 2000-14 is investigated in a regression analysis. The analysis shows a strong relationship between changes in interest rates prevailing in these economies and changes in US interest rates, even after controlling for domestic macroeconomic conditions and the global business and financial cycle. For short-term interest rates, a 100 basis point change in US rates is associated with an average 34 basis point change in emerging market and small advanced economies (Table V.C, first column). 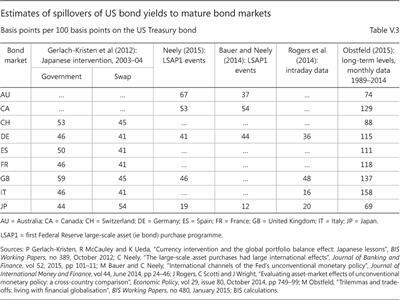 For long-term interest rates, the effect is stronger: a 100 basis point change in the US bond yield is associated with an average 59 basis point change in the yields of these economies (second column). Besides US interest rates, the degree of global investor risk aversion, as measured by the VIX, also consistently emerges as an important driver of these interest rates. 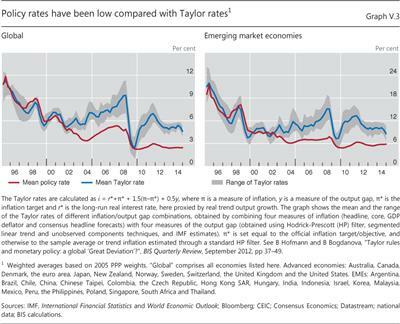 Furthermore, the persistently low global policy rates relative to Taylor rule-implied levels since the early 2000s (Graph V.3) reflect, at least in part, the effect of low policy rates prevailing in the United States over this period. 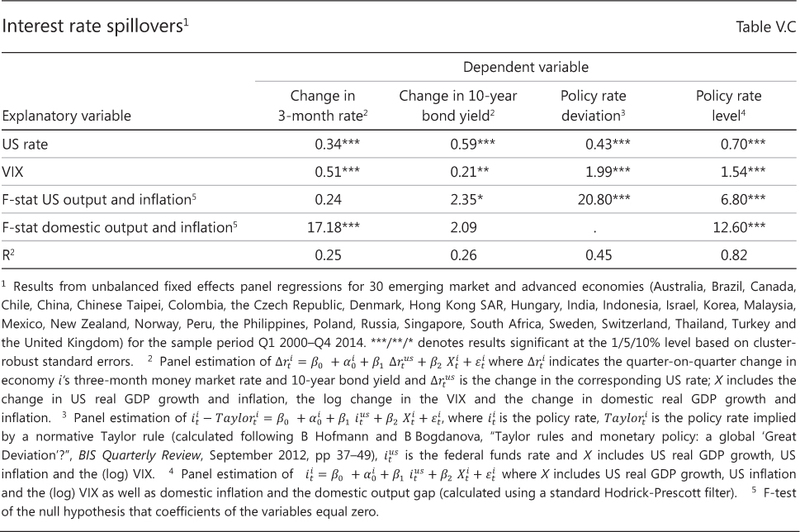 Specifically, a 100 basis point cut in the US federal funds rate is found to lower EME and other advanced economy policy rates by 43 basis points relative to the levels implied by a standard normative Taylor rule (Table V.C, third column). When estimating a descriptive Taylor rule, the estimated impact of the US policy rate is even higher: some 70 basis points (fourth column). In sum, the results suggest an economically significant causal relationship from US interest rates to interest rates in emerging market and other advanced economies. See B Hofmann and E Takáts, "International monetary spillovers", BIS Quarterly Review, forthcoming. Analysis of a broader sample of 62 countries and a more inclusive measure of international capital flows points to a similar dynamic. Here, the larger the net debt inflows, including both portfolio and bank flows, the larger the increase in an economy's ratio of bank credit to GDP (Graph V.4, right-hand panel). The inclusion of Ireland, Spain and the United Kingdom shows that a domestic credit boom's reliance on external financing is not a symptom of financial underdevelopment. In fact, in the subsample of 23 advanced economies the reliance on capital inflows is greater than among EMEs, as the steeper fitted line suggests. In the second, post-crisis, phase of global liquidity, the term premium on sovereign bonds has become a more important driver of funding conditions. 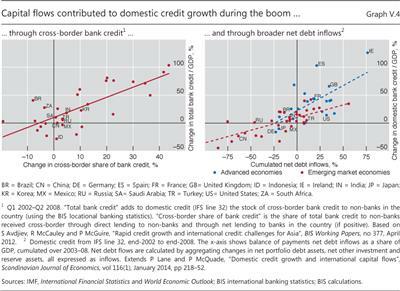 Although cross-border bank credit has continued to expand strongly in EMEs, it has contracted sharply among advanced economies, while bond financing has surged across the board. Even as bond flows have gained prominence, the term premium has emerged as the salient global price of risk in integrated financial markets. To summarise, the workings of the IMFS post-crisis have spread easy monetary and financial conditions from the reserve currency areas to the rest of the world, just as they did pre-crisis. Global financial conditions have consequently loosened to an extent that may not prove consistent with lasting financial and macroeconomic stability. Credit booms in EMEs and some advanced economies less affected by the crisis have built up tell-tale financial imbalances. In the short run, the IMFS has tilted conditions towards expansion. But in the longer run, financial busts, were they to materialise, would tilt them towards contraction. 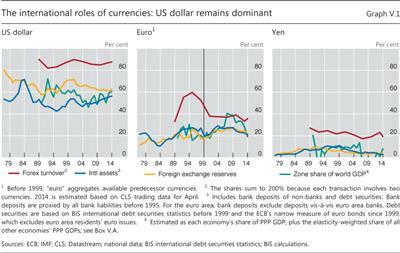 Monetary policy divergence across key currencies and renewed dollar appreciation pose risks. Ease in the euro area might prolong global ease, if firms and governments around the world can substitute euro funding for dollar funding. However, the large stock of dollar debt outstanding means that a tightening of dollar credit is likely to prove consequential. Thus, renewed dollar strength could expose vulnerabilities (Chapter III), especially in those firms that have collectively borrowed trillions of dollars. Admittedly, it is well known that the US economy has a short position in the dollar that funds a long position in other currencies. And by the same token, the rest of the world must hold more dollar assets than dollar liabilities and thus enjoy valuation gains in aggregate when the dollar appreciates. But even in a country with a long dollar position, the distribution of currency positions across sectors matters greatly for the outcome. For example, in many EMEs the official sector has a long dollar position whereas the corporate sector carries a short one (Box V.D). Absent transfers from the (gaining) official sector to the (losing) corporate sector, the economy may well be hurt by dollar strength. Dollar strength, monetary policy divergence and heavy official holdings in the global bond market could lead to volatility. Were EMEs to draw down reserves substantially, their selling bonds in the key currencies could create unprecedented cross-currents in global bond markets. ECB and Bank of Japan bond purchases, EME selling and, eventually, the Federal Reserve's not rolling over maturing bonds could confront the remaining private investors with a difficult and shifting problem of bond pricing. Policies to address the issues raised in this chapter require more than each country managing its inflation and business cycle. A broader notion of keeping one's house in order suggests policymakers deploy monetary, prudential and fiscal policies to manage financial cycles to ensure lasting monetary, financial and macroeconomic stability (Chapters I and IV). 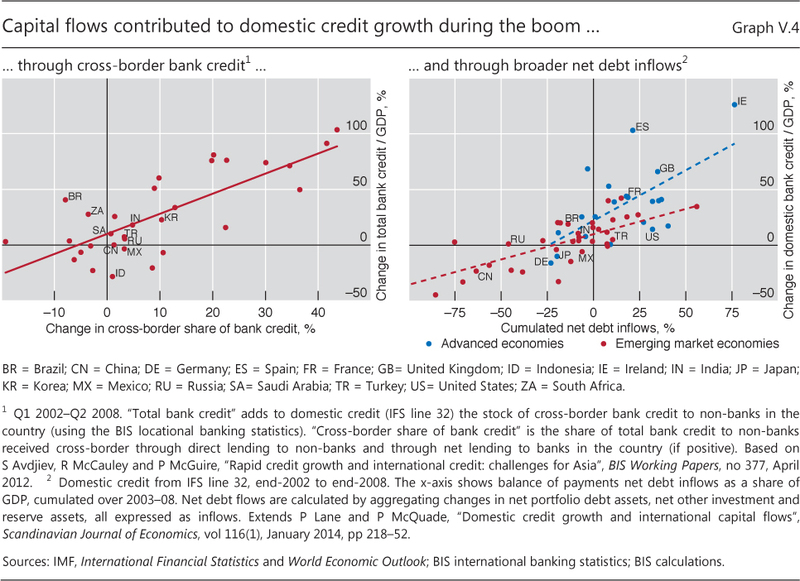 The resulting reduction in the frequency and depth of credit booms and busts would greatly reduce negative cross-country spillovers. This box uses the example of Korea to illustrate that dollar appreciation can deliver wealth gains to non-US residents as a whole, while still representing a tightening of financial conditions for non-US firms that have funded themselves in the dollar. The Korean official sector can gain from dollar appreciation but need not adjust its spending, while the Korean corporate sector can lose net worth and face tighter credit. It is by now well known that dollar appreciation boosts US net international liabilities. This is because US residents have dollar-denominated liabilities to the rest of the world that exceed their corresponding assets to the tune of 39% of GDP. With the appreciation of the dollar in 2014, the US net international investment position declined from -$5.4 trillion to -$6.9 trillion, as US assets stopped growing in dollar terms despite rising local currency valuations. This $1.5 trillion difference was more than three times the current account of $410 billion. Accordingly, the rest of the world's wealth increased. Typical of the rest of the world, Korea's net international investment position as a whole gained from dollar appreciation. Still, Korean firms that have borrowed dollars can still see their net worth fall. Overall, the country's modestly positive ($82 billion in Table V.D) external position shows net foreign currency assets of $719 billion, with over half held by the official sector (official reserve assets of $364 billion) and substantial holdings by institutional investors (portfolio assets of $204 billion). A substantial fraction of portfolio and other foreign currency liabilities ($348 billion), and $65 billion of foreign currency loans booked by banks in Korea, are owed by the corporate sector. Moreover, BIS data show an additional $7 billion of mostly dollar bonds issued by offshore affiliates of Korean non-financial firms, and there is also offshore bank credit. Dollar appreciation leads to official gains that are not conveyed to firms that lose net worth. Much analysis of international balance sheets, in general, and the insurance afforded by foreign exchange reserve holdings, in particular, implicitly suffers from a fallacy of division, according to which what is true of the whole is true of the parts. In the absence of transfers made when the domestic currency depreciates - which would themselves be fraught with moral hazard - the gains in the public sector do not offset corporate losses. Firms need to adjust their spending and hiring. And if the authorities eventually deploy international reserves to provide dollar liquidity to banks and firms, the intervention may follow disruptions that have already exacted a price. See C Tille, "The impact of exchange rate movements on US foreign debt", Federal Reserve Bank of New York, Current Issues in Economics and Finance, vol 9, no 1, January 2003. In addition, policymakers could give more weight to international interactions, including shared exposures, spillovers and feedbacks, with a view to keeping the global village in order. Policies could either seek to prevent crises, through measures to restrain the build-up of financial imbalances, or to strengthen crisis management, including through safety nets. An ounce of crisis prevention is worth a pound of crisis management: there are clear welfare benefits from reducing the incidence and severity of crises and clear limits of foresight and moral hazard in designing effective safety nets. International policy coordination can occur at various depths. Enlightened self-interest takes international spillovers into account to the extent that they spill back on one's own economy. However, even if countries did their best individually, this would still fall short of the mark if there were significant international spillovers, as in today's era of global liquidity. Moving towards a more efficient outcome would require greater cooperation, including ad hoc joint action, and possibly even agreement on rules of the game that constrain domestic policies. Obstacles present themselves in terms of both analysis and cooperation. There is the difficulty of agreeing on a diagnosis of what ails the IMFS. And even if a common understanding of international spillovers and their causes emerged, it would remain challenging to forge and to maintain a common approach among multiple actors of varying sizes subject to differing domestic constraints. Such possibilities and obstacles are evident in the discussion concerning crisis management. During the Great Financial Crisis, central banks proved able to make swift joint adjustments to their policy stances and to coordinate closely in extending foreign exchange swaps to each other. Funding extended under dollar swaps reached almost $600 billion (and, under euro swaps, €6 billion). The dollar swap lines supported financial stability by allowing the funding of foreign banks with limited access to Federal Reserve facilities. In turn, they also restored the monetary transmission mechanism after banks had been bidding up dollar Libor relative to the federal funds rate. Today, proposals to modify and extend safety nets face obstacles. One reason is deep analytical disagreement. Is reserve accumulation a by-product of exchange rate management, or a form of self-insurance against domestic and external crises? Should international liquidity facilities, including currency swap lines between central banks, be broadened, and what is their best design? Would enhanced safety nets lead to smaller foreign exchange reserves? And, even if agreement were reached, many aspects of international risk-sharing would remain problematic. Despite the room for improvement, the status quo may well persist. All this reinforces the case for crisis prevention. Here, central banks could seek to internalise the effects of their own policies. An improved exchange of information would help authorities to reach a better understanding of international spillovers and spillbacks. For instance, if the major central banks' monetary policies have indeed induced competitive easing among EMEs, the resulting financial imbalances may ultimately hurt the advanced economies. What is more, such spillbacks may be stronger than in the past, in line with EMEs' growing weight in the world economy (Chapter III). Similarly, the outsize official role in major bond markets points to the need for policymakers to pay attention to global effects. 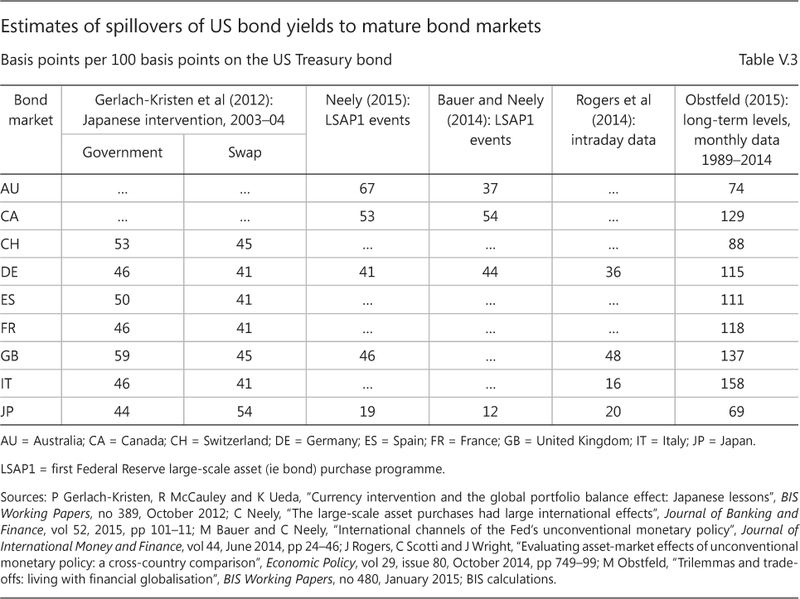 However, while global reserve managers might collectively benefit from taking into account the effect of their investment behaviour on global bond yields, their individual incentive is to ignore international spillovers. 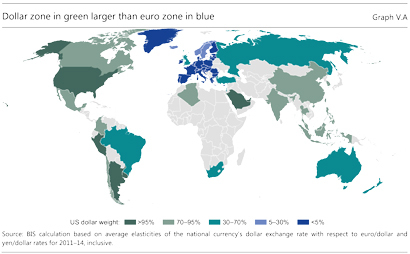 Much of international macroeconomics assumes that national borders delimit currency zones and decision-making units. Just as the national accounts do, it assumes that those borders define the relevant economic territory: different currencies do not compete within a given country and firms operate exclusively within national borders. In reality, neither is the case. Not only does the domain of major currencies extend outside their country of issue (Boxes V.A and V.B), but multinational firms, be they financial or non-financial, operate across borders. Management focuses on group-wide profits and risks, and balance sheets span national boundaries. A consolidated perspective better reflects the reach of multinational firms and the extent of global integration. This box uses the US example to illustrate how such a consolidated view of foreign assets and liabilities differs from the official international investment position (IIP) recorded on a residence basis - the defining criterion of the national accounts and balance of payment statistics. These are denoted "locational" in the first two columns of Table V.E. The process of consolidation aligns balance sheets with the nationality of ownership rather than with the location where the assets and liabilities are booked. This amounts to redrawing the US border to include the foreign balance sheets of US-owned firms, and to exclude the US balance sheets of foreign firms. This consolidation is performed here for the banking sector and the non-bank business sector (multinational companies). The first step replaces the banks' external positions with consolidated BIS data (three rows under "bank-reported" in Table V.E). This removes all cross-border claims of, say, BNP Paribas New York on the rest of the world (these being French assets), and adds JPMorgan's consolidated foreign claims, yielding a total of $3.330 trillion for reporting US banks combined. Similarly, on the liabilities side, out goes any cross-border liability of BNP Paribas New York, and in comes JPMorgan's global foreign liabilities, to give an estimated $2.958 trillion for US banks. Moreover, foreign banks' local operations in the United States, which are not part of the US external position, further add to US consolidated assets and liabilities, respectively, to the extent that US residents provide funding ($2.465 trillion) to, or receive credit ($3.150 trillion) from, the US offices of foreign banks. 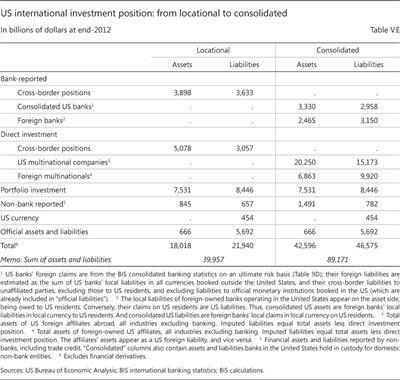 Consolidating banks raises the sum of US foreign assets and liabilities from $40 trillion (IIP) to $45 trillion. The second step consolidates foreign-owned multinational companies (excluding banks) in an analogous, though coarser, way (owing to data limitations). 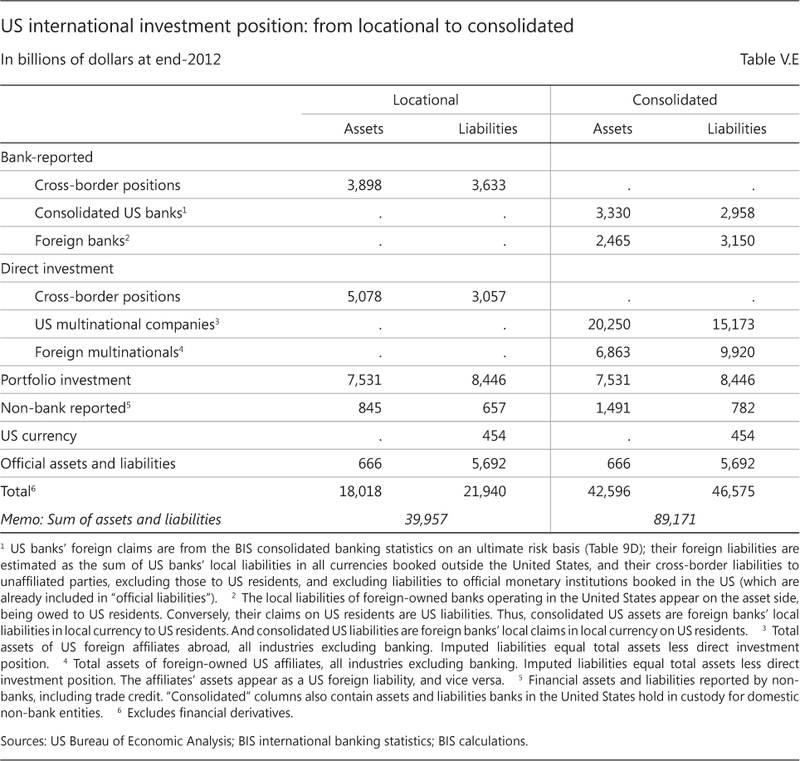 The cross-border direct investment positions of non-banks, assets and liabilities, are replaced by the (larger) total assets of US multinationals outside the United States and by those of foreign multinationals in the United States, respectively (rows under "direct investment" in Table V.E). Out goes General Electric's equity position in its French subsidiary, and in comes that subsidiary's total assets, resulting in $20,250 billion for all US-owned multinationals combined. These assets exceed the corresponding ownership claims (consisting of $5,078 billion worth of equity and equity-like inter-affiliate debt in the IIP) because US multinationals also borrow abroad; these liabilities (an estimated $15,173 billion) in turn add to US foreign liabilities. As for foreign multinationals, French firm Total's stake in its US subsidiary is removed, and its US assets are added - yielding $9,920 billion for foreign multinationals. 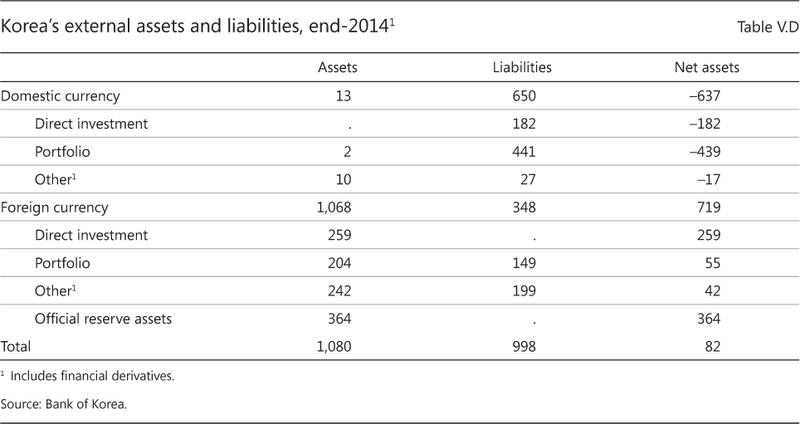 Foreign multinationals' liabilities ($6,863 billion) count as a US foreign asset. This step sextuples directly held corporate assets and liabilities, but leaves US net assets unchanged. Together, consolidating banks and multinational companies more than doubles the gross foreign position of the United States. US external assets and liabilities combined jump from $40 trillion on a residence basis (IIP) to an estimated $89 trillion when measured on a consolidated basis. The example reveals that the US economy is more open, and its foreign balance sheet larger, than is apparent from the external position derived from the balance of payments. The calculation of the US current account, on the other hand, should not be affected by consolidation, since foreign earnings are included in net investment income whether they are repatriated or not. It may be difficult to go beyond enlightened self-interest and to revisit rules of the game more broadly.8 Many reject a global perspective in the realm of monetary policy. Accordingly, domestic mandates ask major reserve-issuing central banks to set policy for a smaller economic domain than that occupied by their currencies. This interpretation of domestic mandates contrasts sharply with successful international cooperation in the realm of financial regulation and supervision. There, national mandates have not precluded extensive international cooperation and the development of global rules. The focus on current accounts and the corresponding net resource flows, however, arguably glosses over the IMFS's fundamental weakness. The aim of rebalancing global demand reduces the notion of imbalances to net flows in goods and services between countries, and neglects the greater risk of financial imbalances building up within and across countries. To be sure, large current account deficits often point to underlying problems, but financial booms and busts can and do develop in surplus countries as well. An aggregate surplus position may well conceal such vulnerabilities. Financial imbalances are more closely linked to domestic and international gross positions, and need not leave a mark on cross-border net flows - what current accounts represent.10 Indeed, financial imbalances may not show up in a country's balance of payments at all if multinationals issue debt offshore for their use abroad, for instance. This, in turn, raises the question of the appropriate unit of analysis in international finance, with consequences for how one should measure the risks (Box V.E). Making progress on the design of the IMFS thus calls for a new diagnosis that accounts for financial imbalances as a basis for broad adjustments to domestic policy regimes and their international interaction. 1See C Borio, "The international monetary and financial system: its Achilles heel and what to do about it", BIS Working Papers, no 456, August 2014; and C Borio, H James and H S Shin, "The international monetary and financial system: a capital account historical perspective", BIS Working Papers, no 457, August 2014. 2See R McCauley, P McGuire and V Sushko, "Global dollar credit: links to US monetary policy and leverage", Economic Policy, vol 30, issue 82, April 2015, pp 189-229. 3See V Bruno and H S Shin, "Cross-border banking and global liquidity", Review of Economic Studies, vol 82, issue 2, April 2015, pp 535-64. 4See H Rey, "Dilemma not trilemma: the global financial cycle and monetary policy independence", in Global dimensions of unconventional monetary policy, proceedings of the Federal Reserve Bank of Kansas City Jackson Hole symposium, August 2013, pp 285-333. 5See J-H Hahm, H S Shin and K Shin, "Noncore bank liabilities and financial vulnerability", Journal of Money, Credit and Banking, vol 45, issue s1, April 2013, pp 3-36. 6Compare R McCauley and G Jiang, "Diversifying with Asian local currency bonds", BIS Quarterly Review, September 2004, pp 51-66 and the following: K Miyajima, M Mohanty and J Yetman, "Spillovers of US unconventional monetary policy to Asia: the role of long-term interest rates", BIS Working Papers, no 478, December 2014; Q Chen, A Filardo, D He and F Zhu, "Financial crisis, US unconventional monetary policy and international spillovers", BIS Working Papers, no 494, March 2015; and Box V.C. 7See C Borio and R McCauley, "The economics of recent bond yield volatility", BIS Economic Papers, no 45, July 1996. 8The case for change has been put forward by R Rajan, "Competitive monetary easing: is it yesterday once more? ", remarks at the Brookings Institution, 10 April 2014. For more sceptical views on policy coordination, see eg S Fischer, "The Federal Reserve and the global economy", Per Jacobsson Foundation Lecture at the IMF/World Bank Annual Meetings, 11 October 2014; and B Cœuré, "Domestic and cross-border spillovers of unconventional monetary policies", remarks at the Swiss National Bank-IMF conference "Monetary policy challenges in a changing world", 12 May 2015. See also J Caruana, "The international monetary and financial system: eliminating the blind spot", remarks at the IMF conference "Rethinking macro policy III: progress or confusion? ", 16 April 2015; and W Dudley, "US monetary policy and emerging market economies", remarks at the Federal Reserve Bank of New York roundtable discussion "Three decades of crises: what have we learned? ", 27 March 2014. 9The European Commission's Macroeconomic Imbalance Procedure goes further in complementing its surveillance of external imbalances with indicators on internal financial imbalances. 10See C Borio and P Disyatat, "Global imbalances and the global crisis: link or no link? ", BIS Working Papers, no 346, May 2011.